We believe that innovative ideas and personal service experience is very important to create a successful website. This is why we not only work for building the perfect website, but also provide the necessary post sales services to our customers so that they get expected ROI. Web 2.0 & Web 3.0 Services: What is the first impression while one is looking at a website?? It is warm and tempting enough to get a user to click and click and explore more and more? Till such time everybody had their own versions of what is good and what is not, till Web 2.0 design took over! Web 2.0 goes beyond fetching information from a website. The concept boosts participation from all users through various interactive features. What really forms Web 2.0 is - Interactivity, enhanced user expferience, adherence to some basic standards and most importantly the ease to build on it further. Our wide range of expertise and experience allow us to deliver measurable, high-quality design and development services based on web 2.0 technologies. With W3care, you will get highest quality solutions at lower cost with shortest turn-around time. Web 3.0 – Feeling more intelligent than before: The third generation of Web is now more connected, natural languages, machine learning, open and intelligent as well. As we know that users’ interaction with others is the main purpose of web 2.0. However, it needs to be change for more features and user friendly and with the new benefits of more focus on users’ themselves which is going to be synonymous with the user’s interaction in web 3.0 also as per user needs web essentially adjust to meet. We’ll receive more related results as per our search. The main purpose of web 3.0 that user can access much data from anywhere. W3care team is using the same for our client’s benefits and of course for their users also. By using of web 3.0 we have found that it makes the design more attractive and the truth is that designer should be the absolute power to read users that where they will look first and second and so on. These things help a lot to increase traffic on your site. And web 3.0 is helping designer to do so. Using web 3.0 we don’t need to create two different websites for same purpose, one for desktop and other for mobile devices. Our developers and designers using web 3.0 and they hit two targets with one solution, by creating one website that will look good in both environments. With the help of web 3.0 design, designers decide that what should they do for make design more attractive as per client requirement or by providing a suggestion to client which becomes popular. May be there should be some question in your mind or you want to more about web 3.0. Please feel free to contacts us. We’ll reply to your query in 24 hours. Responsive Web Design: With the increasing demand of internet in today’s world for the day to day work and other activities, there was a rise in the demand of moving the ever easily approachable and easily accessible websites over the mobile devices. This gave birth to the responsive designs. Responsive website design has made the approach of opening a website over desktop or mobile device very easy. It is an approach where the designer or the developer does not have to design or code separately for different devices. A same dynamic code, that is accessible through any screen size. Website design has become more powerful with the introduction of responsive web design. Now we can design a website that can fit into each and every screen size. It may become scaring off to ask your designer each time to make your design compatible to each new devices when they are introduced. But now responsive web design has facilitated us to use any surface as a screen!! 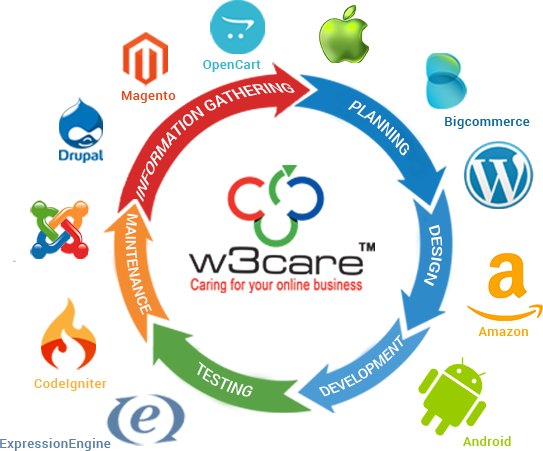 W3care is a former adopter of Responsive Web Designing and normally we recommend it to our customers. Our responsive web design services ensure our customers that screen variations don’t affect the quality of website view and their audience is able to experience their brand through the website. We at W3care are proficient with the skills of HTML5 and CSS media which are required for the creation of the responsive web designing. which finally results in, the consistent stream of design in all the screens, less efforts for SEO and marketing activities and gives best quality experience without bothering about the screen size. Why Our UI and UX Design Services are Best? W3care Technologies has a good will to provide best solution for website and mobile application development.We have developed hundreds of websites and dozens of mobile applications.We have experienced teams of developers who believe in providing satisfaction to clients.We have expertise designers to fulfill your needs of website design.Our team is dedicated to the work and always provides eye caching and SEO optimized designs. W3Care have always been incredibly supportive and have a 'can do' attitude in helping bring initiatives to reality in support of business goals. No job ever seems too daunting for them to handle and their service is always typified by professionalism, commitment and resolve. They're a thoroughly decent bunch of people to work with, provide excellent value and we would not hesitate in recommending their services to other companies.